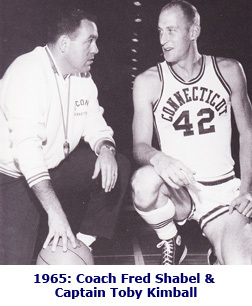 Fred Shabel was the Head Coach of the UConn men’s basketball team from 1963 – 1967. He enjoyed 72 wins and only 29 losses during his tenure. I had the pleasure of talking to Fred in January 2005 about his basketball experiences as a player, coach, athletic director, and his involvement today in the sports and entertainment world. Fred started playing basketball when he was 11 or 12 years old. The kids went to the school yard where they used metal rectangular backboards with round holes, attached to a pole or against a brick wall as their baskets. “I was working for my father in a fruit and vegetable store, and I had a bicycle with a big basket. I would deliver orders for my father as a young kid, and I would stop off at the school to play basketball.” Later his father put a backboard up in the dirt yard behind the vegetable store. Fred went to Union Hill High School in Union City, New Jersey, and played on the basketball team with other future New England great players Togo Palazzi and Tommy Heinsohn from Holy Cross University, and Billy Baird who played at the University of Rhode Island. “We had a really strong high school basketball team.” They didn’t win any state championships but they went to the state tournament a couple of times while Fred was there. After high school, Fred went to Duke University on a basketball scholarship. Duke wasn’t the same level of basketball then that it is today. Fred’s position was a guard, and in those days you could get away with being a slow guard because teams didn’t use full court pressure. Fred told me he sat on the bench quite a bit during his sophomore and senior years but as a junior he started about 14 games. He enjoyed running the offense and being a play maker. Fred held the assistant coach position at Duke for the next six years. In his sixth year the team made it to the National Collegiate Athletic Association Tournament Final Four. Just prior to the tournament Fred was offered a head coaching job at Rutgers University, after the tournament was over, Fred decided not to accept the position at Rutgers, and would remain as an assistant at Duke. 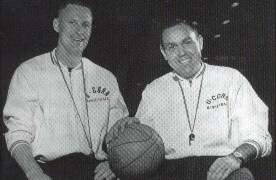 A little trivia about the Final Four: In the 1960’s there was a consolation game so if you lost the first game in the Final Four, you played for third place. Duke was beaten by Loyola of Chicago who ended up winning the national championship game. Duke played Oregon in the consolation game and won. Duke had an All American player, Arthur Heyman, who won Most Valuable Player Honors of the Final Four even though he didn’t play in the final game. After the Final Four, the University of Connecticut contacted Fred to become the head basketball coach. He accepted, and although Rutgers always thought he refused them to go to CT, it wasn’t true. The transition from Duke to UConn was significant because UConn had a very conservative athletic department. It really wasn’t giving out athletic scholarships. Scholarships were based on a financial-need-only basis, and the kind of big-time basketball support was not the same as what Fred was used to at Duke. Fred tried to bring the Duke model to UConn with the start of the pep band, and he brought entertainment to the games, and signs, and decorations. UConn was dominating the Yankee Conference, and Fred was trying to move it to another level. He had positive results. The first year Fred was at UConn, the team went to the Final Eight in the National Collegiate Athletic Association Tournament only to get beaten by Duke. Some memories while coaching at UConn were of a playoff game against the University of Rhode Island. Fred and the head coach at Rhode Island had to meet halfway between Storrs and Rhode Island to flip a coin as to where the playoff game would be played. Fred remembered a game while he was coaching when UMass head coach Johnny Orr got mad at some calls, and started throwing his coat and the student body came out of the stands, and there was a big fight on the floor. Fred also remembered a game while at UConn, only a year after leaving Duke. UConn met Duke in the Final Eight of the NCAA Tournament. Fred said that someone asked him if he had mixed emotions playing Duke and Fred’s response at the time was, “No, CT pays my salary”. After coaching four years at UConn, Fred decided he wanted to get out of coaching, and became UConn’s assistant athletic director. After only a few months, the University of Pennsylvania contacted Fred to become its Athletic Director. During Fred’s eight years as athletic director at the University of PA, the basketball team was nationally ranked. 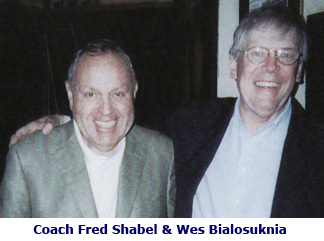 Fred had hired Chuck Daley from Boston College to be the head coach of the University of Pennsylvania. Chuck Daley later went on to win two National Basketball Association Championships as coach of the Detroit Pistons. Next Fred became Vice President of the University of PA for five years. “I left Penn in 1980, and became the president of the company I’m still with, Comcast-Spectacor. We own the Philadelphia 76ers basketball team, and the Philadelphia Flyers. We own the Cable Systems in Philadelphia that the games are watched on, and we own the Wachovia Center where UConn plays Villanova when they come to town. I’m the Vice Chairman of Comcast-Spectacor.” Fred still attends UConn games when UConn men or women are in Philadelphia, and he watches UConn during the NCAA Tournament. Fred’s thoughts on Coach Calhoun, “Jim Calhoun, and that whole athletic department has just brought UConn basketball to the heights that I don’t think any of us ever would have realized they could do. Coach Calhoun is a sensational coach.” Fred also said that over the years the athletes have become stronger, faster and bigger. He doesn’t think the athletes from the ‘60’s compare to the athletes of today, with all due respect. Fred has been married to his wife, Irene, for 15 years. Irene is a graduate of Penn Wharton School, and has held professional human resource and labor relations career positions. Throughout her career Irene was the Vice President of Human Resources at Princeton University. Fred’s first child, Lisa was born in CT while Fred was at UConn. Lisa is currently a professor of philosophy at Ohio State University. Fred’s second child, Alan, was born in Philadelphia. Alan has a Ph.D. in Paleontology from Berkeley, California. Alan and his wife Sophie have two children; Gemma and Samuel.